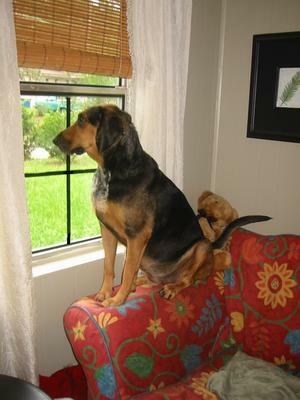 I have adopted a 6 yr old female Coonhound, she is a mix of a Bluetick and Black&Tan. I literally adopted her from a picture I found on the net at petfinders.com. I was looking for a companion for my elderly Pitbull female (11 yrs) and had been told that a hound dog has a very compatible nature around most other breeds, and since my own dog has some temperament and character flaws – I thought I would give a hound a try. The website said that she was a large hound mix and did not provide many details, but I was told that the rescue group was willing to introduce her to my own dog by coming to my house. Well – when she arrived and climbed out of the car I initially was shocked how large she was (95 lbs). But the introduction to my own dog went well and I was willing to give it a try. The rescue worker calmly informed me that she is a coonhound and had a very rough past. She had a forgotten collar around her neck when she was found that had grown into her skin and had to be surgically removed, she had been shot, was missing pieces of her tongue and over half of one of her ears, she had a very foul breath, dirty and scruffy looking and with an old very wide nylon collar that had seen better days. I was told that she spent her days and nights tight up to a doghouse on a so called ranch. It was also explained to me that she had been adopted 4 times over the past 3-4 years but was returned each time, and the group had pretty much given up to find her a permanent home. They assured me that they would take her back in case I did not want to keep her. Within 5 minutes after that initial conversation I had changed her name from Bonnie to Emma and welcomed her into our little family. I was determined that she has found her for-ever home with us! Emma was not housetrained, but learned within 24 hours how to use the dog door and we only had one accident during the first night. She did not know how to walk on a leash, but after about 3 weeks she was fine with walking on a harness and long walking leash. Emma was an escape artist and found weaknesses in my wood privacy fence and peeled off the panels with her strong claw-like paws to get out of the back yard. After I reinforced the whole fence, she started to push herself into a corner and 'walked' up the fence and jumped over to visit a nearby creek. Once Emma was out of the fence she would not listen, not even react toward a call or whistle, I could only run or drive after her and wait until she returned from the creek. In the house she was very good right from the start; she never chewed or destroyed anything, and appeared to be overall very laid-back. But – as soon as it got dark the gremlin in her came out, she would go in the back yard and bark and bark and bark – after squirrels, raccoons in my large oak tree, the occasional opossum, cats and everything that moved. Did I say that coonhounds have a very powerful voice that seems to echo in the dark and bounces off the walls, and is probably heard by the whole neighborhood, and she also scarred my old dog to death! I had to lure her inside with food – food works very well with coonhounds! But slowly doubts came crawling into my head and little voices would tell me that I am not able to give her what she needs and wants, and still be welcomed in my neighborhood. But I refused to give up, I read everything I could about coonhounds, about their nature, character and breed, and slowly began to understand her. Now I know that Emma did was she was trained to do: hunt at night and bark very loudly. She had never been taught to bond with a person or how to live in a house. So I started to make her understand that she was safe with me, that she was home, and no matter what that I love her. It has been almost 8 months now since we first met and today Emma does understand that she is part of our family. Today she follows me around the house in person or with her big brown eyes, sleeps on her back with all for paws stretched out, whines when she wants something, she plays with her teddy bear, searches for bones that I hide around the house for her, and she listens when she is called by name. Today when it gets dark – she still ventures outside and sometimes barks for a while – but that's o.k. because she is a dog – a coonhound – and it’s aloud. When it is time to go to bed, I call her and most of the time she comes right away, but sometimes I have to wait a little, and that’s fine with me – because I know that she will come without being called a second time in a little while. I don’t try to teach her absolute obedience, because I don’t think she needs or wants it. Emma loves her schedule and depends on it to be happy. She knows when it is time to eat, sleep, play and time to go for a walk, and she will protest if I violate our rhythm. Unfortunately Emma has never really bonded with my Phoebe – but I think that the fault is not hers, but both live in unity together and lately started to go outside together. Today Emma is a happy and relaxed dog with a silky and shiny coat, a watchful companion that can be goofy and serious. She expresses her emotions with a variety of sounds and "huffs and puffs". Emma took over my office and its guest bed and it is hers! Today Emma greats me every day along with Phoebe when I get up in the morning or come home from work. Today she knows that she belongs, and I only regret that it took me so long to find her. What a beautiful thing to you did. Not just adopting Emma, but understanding her needs. Please, never, never think about her past. As long as she is with you, she won't either. We had a black and tan when I was a teenager. She would lie on top of me (really didn't understand her weight or size). Sweet, sweet dog. However, like you have mentioned, she was an escape artist. Climbed a 6 foot fence!